This article will aid you remove Matrix Ransomware effectively. Follow the removal instructions at the end. The .EMAN Matrix Ransomware is the newest strain associated with the Matrix family of malware. Like previous versions it has an extensive list of modules that are launched, they impact every single area of the operating system. Depending on their configuration they can also lead to the installation of other threats — viruses, ransomware, miners and Trojans. Our guide explains how computer users can spot the infections and attempt to remove them. Symptoms The ransomware will encrypt your files and put the extension .EMAN to them after it finishes its encryption process. The .EMAN Matrix ransomware follows the same old distribution tactics as previous iterations of this family. It is very possible that the attacks are being operated by the same hacker or group behind previous attacks or the code has been customized/bought by another malicious actor. It is very possible that the code is for sale on the underground markets and that interested buyers can buy custom copies of the Matrix ransomware. This particular threat is known to make heavy use of email SPAM messages — they are disguised as legitimate messages from well-known companies or services. The virus files can be either attached directly or hyperlinked in the body contents via in-line links. The call-to-action button leading to the infection may be disguised as a document download, link to a software update or another important action that the user must take. A similar strategy is the use creation of fake web sites — they are designed to appear like any ordinary Internet portal or vendor download page. The hackers behind it may use tactics such as the registration of similar sounding domain names, security certificates and stolen content and/or design. Documents — Macro-infected documents are a popular source of infections. They can be of any of the popular document types: presentations, rich text documents, spreadsheets and databases. Once they are opened by the targets a message box which will appear asking them to enable the built-in scripts. If this is done the built-in scripts will be started, they will lead to the virus installation. Application Installers — The criminals can hijack the legitimate setup files of popular software often used by end users. This includes examples such as system utilities, productivity applications, creativity suites, multimedia players and etc. Note that such threat can often be found on P2P networks as well which are used to spread various files among their users. One of the most popular example of this technology is BitTorrent. Scripts can also redirect the users to the fake sites: banners, pop-ups, in-line links, redirects and etc. Advanced distribution tactics can make use of malicious browser plugins — they are made compatible with the most popular web browsers and advertised as enhancing their functionality. The individual strains are uploaded using stolen or fake developer credentials and user reviews in an attempt to advertise as much as possible. When they are installed on the target hosts typically they will modify the default options and redirect the users to a hacker-controlled site and then the virus infection will follow. The .EMAN Matrix ransomware sample follows the same behavior patterns as previous strains of the malware family. 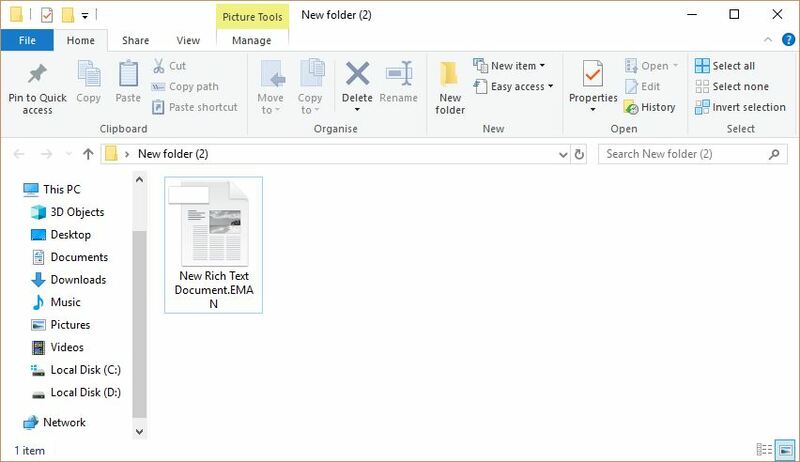 One of the first actions that by default is run is the data extraction module, it is used to harvest sensitive information about the infected computer which is used to assign the individual victim ID of the computer. It may expose the victim’s identity by searching for strings that include the person’s name, address, interests, location and any stored account credentials. The other data that is used during the ID generation is made up of details about the installed hardware components, user settings and operating system variables. This information can then be used by another module that is assigned to offer stealth protection — it will search for security software that can interfere with the ransomware’s correct execution — examples include anti-virus software, virtual machine hosts and debug (sandbox) environments. When this step has complete the hackers will have total control of the infected machines. At this point the rest of the modules can be downloaded and unpacked from the hacker-controlled servers. An important part of the infection process is the manipulation of the Windows Registry — changed values belonging to the operating system can lead to severe performance issues. If application strings are affected then certain functions may be blocked. Many Matrix ransomware family versions feature code that deletes system data: System Restore Points and Shadow Volume Copies. Advanced infections not only will report the infections to the hacker-controlled servers, but will also lead to a Trojan virus deployment. It will use the established secure connection to spy on the victims, take over control of the machines and deploy other threats. A side effect of this is the deployment of cryptocurrency miners — scripts or small programs that leverage the available hardware resources in order to carry out complex calculations. They are very intensive on the system resources and when complete the malicious operators will be rewarded for the posted results of the complete job. The victim files will be renamed with the .EMAN extension, the associated ransomware note will crafted in a file called #README_EMAN#.rtf#. The ransomare note will also be displayed as the user’s desktop. If your computer got infected with the Matrix Ransomware ransomware virus, you should have a bit of experience in removing malware. You should get rid of this ransomware as quickly as possible before it can have the chance to spread further and infect other computers. You should remove the ransomware and follow the step-by-step instructions guide provided below. Hey !, I found this information for you: "Remove Matrix Ransomware and Restore .EMAN Files". Here is the website link: https://sensorstechforum.com/remove-matrix-ransomware-restore-eman-files/. Thank you.